Under Arizona Law A.R.S. 28-1381 (A) (3) it is illegal for a person to drive impaired due to drugs. This law includes drugs that are dispensed by prescription under medical supervision. This law applies only if the prescription caused the driver to be impaired. It is also referred to as a drug DUI. What is a Prescription - Only Drug? Prescription – only is defined under A.R.S. 13-3701 (28). It refers to a drug that can only be obtained by prescription. The medication must also be prescribed under the supervision of a doctor or other authorized medical professional. Prescription only does not include dangerous drugs or narcotics. 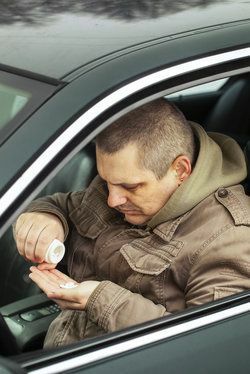 What are Some Prescription Drugs that Cause Driver Impairment? The most common drug that causes prescription DUI are opioids, also referred to as pain killers. As a former prosecutor and highly skilled DUI defense attorney, with over 20 years of experience, James Novak is well versed in all aspects of impaired driving laws and charges. James Novak can protect your rights and provide strong representation on your behalf for your drug impaired driving charges. For a free initial consultation contact James Novak of the law Office of James Novak at (480) 413-1499 or complete our on-line contact form. What are the Penalties for a Prescription Drug DUI? Penalties for a prescription drug DUI are similar to an alcohol related impaired driving charge. A first-time offense is a class 1 misdemeanor. Penalties include 10 days jail terms which may be reduced to 1 day upon successful completion of an alcohol/drug screening and education program; $1,250.00 in fines, fees, and assessments; and loss of driving privileges. Arizona recently passed a law making it no longer a mandatory penalty for the defendant to use an ignition interlock device on their vehicle after reinstatement of driving privileges. Instead the judge has the discretion of whether or not to order it. What Happens if a Driver Does not Know it is Against the Law to Drive Impaired Due to Prescription Drugs? It is not a valid defense to drive impaired because you did not know that it was unlawful. However, if you were unknowingly given a prescription drug that caused you to drive impaired, it can be used as a defense. What Defenses can be Used to Defend My Prescription Drug DUI Charges? The defense strategies that may apply for prescription drug DUI charges will be based on the unique circumstances of your case. The best way to raise a challenge or defense is by retaining legal representation from an experienced criminal defense attorney, like James Novak of The Law Office of James Novak. Contact DUI Attorney James Novak today at (480) 413-1499 to discuss your DUI matter and find out how to resolve your charges. According to recent Arizona Governor’s Office of Highway Safety, prescription drug DUIs have been on the rise for more than a decade. The number of drug DUIs (both illegal and prescription) increased by 12%. In fact, in some parts of the greater Phoenix area, such as Mesa, drug related DUIs constituted more than half all DUI arrests. Unfortunately, many don’t realize that their prescriptions cause impaired driving, and they do not know that it is considered illegal to drive while taking them. In 2017, Arizona Governor declared a State of Emergency due to the opioid epidemic. Following the declaration comprehensive legislation was passed in 2018 aimed to reduce opioid abuse, which has largely contributed to the increase in drug DUI charges. Earlier this year the U.S. Department of Transportation, and National Highway Traffic and Safety Administration (NHTSA) held a summit to address the growing concerns of drug impaired driving. Among others aspects the focus was on drug DUI education, testing, impaired driving measurement, and law enforcement. NHTSA attributes the sharp increase primarily to opioid abuse and use of marijuana. Recent surveys revealed one in every 4 drivers were under the influence of a drug that could cause driver impairment. In light of Arizona’s opioid crisis, as well as the increase in use of medical marijuana prescriptions, more people are driving under the influence impaired, not realizing that it is prohibited. If you have been accused of driving under the influence of prescription drugs, call attorney James E. Novak today. Arizona has some of the most rigorous drug DUI standards in the country. Without effective representation your charges could result in a swift and harsh conviction. It is important that you contact an experienced drug DUI defense lawyer, like James Novak to protect your rights, and defend your charges. Early retention of a criminal defense attorney for help you preserve your rights and defenses, and provide your attorney with the opportunity to begin crafting an effective defense strategy. James Novak’s vast experience in this specialized branch of law is the surest way to protect your rights if you have been charged with a DUI of any kind. For a free initial consultation for your charges call (480) 413-1499. You can also complete our on-line contact form to speak directly with James Novak, former prosecutor and experienced Drug DUI defense lawyer regarding your DUI matter.